You are currently browsing the tag archive for the ‘Morley Library’ tag. 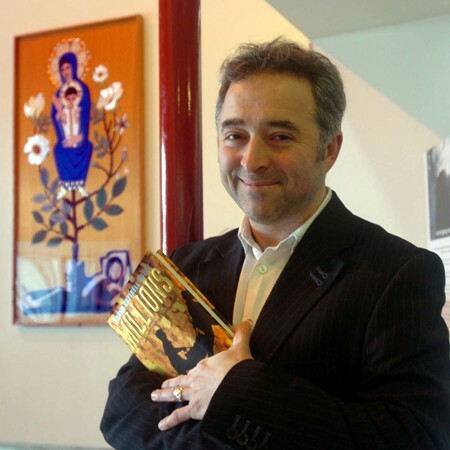 Last month the writer Frank Cottrell Boyce visited Morley Library as part of a Find Your Talent supported event. Reading from his two novels Millions (winner of the 2004 Carnegie Medal) and Cosmic the writer collaborated with Artemis who supplied artefacts for the event. The event encouraged young people to engage with literature in a hands-on way, and introduced them to the idea of how being successful doesn’t necessarily equate with fame. The writer, originally from Liverpool, has worked in a variety of writing roles over the years; from scriptwriter on Brookside and Coronation Street through to an array of prize-winning children’s fiction. As a screenwriter he is best known for his collaborations with Michael Winterbottom (including 24 Hour Party People and Welcome To Sarajevo) and also had his novel Millions developed into a film in partnership with Slumdog Millionaire director Danny Boyle. Boyce also wrote and staged his first original theatre production Proper Clever at the Liverpool Playhouse during the European Capital of Culture Year 2008. During the Morley event, in front of a sold out audience of 350 young people (aged between 8-14) he discussed how money causes problems, and how it inspired the concept behind Millions. The writer engaged with the young audience in this lively reading, and sold out his entire stock of novels on the day. He signed copies of books, postcards, and through an informal Q&A session explained how his own personal process of writing had enabled him to become a successful writer.